THIS EVENT IS NOW OVER! CONGRATS TO ALL THE WINNERS. Winners: All Amazon cards have been purchased via the Amazon.com website and sent by email to the winners. If you don't get an email, check your spam folder. If you still can't find it email us at reviews@nightowlreviews.com to confirm you put in your correct email address on the entry form. Looking for a conference to attend? Visit the the "Fall in Love with New England" Romance Reader Conference webpage. They are one of our event sponsors! Thank you Tammie, just saw the email telling me I won. And thanks to all the wonderful Authors who participated. Love these events. ?? Congrats Redtweetypie! Sounds like it's time to buy some great books from the event authors. I just got an email from Tammie that I won a $10 Amazon gift card. Yay! Thank you so much Tammie and all the wonderful authors that participated in the Spring Fling! These scavenger hunts are so much fun, and I always find new authors and reads to enjoy. On May 04, 2017, Vampoe said: Spring is Flung! Her Best Man, Devil's Tango, A Stranger She Can Trust, Her Hopes and Dreams and Reckless Need to my wishlist. What a wonderful selection of books! I have added Prince of Power by Nancy Gideon, Bedding the Highlander by Sabrina York, and A Pirate's Revenge by Meg Hennessy. Thanks for sponsoring this fantastic scavenger hunt. Thanks so much for these hunts! I love ten! Added to my wishlist are WeAre Always Watching, Her Best Man and Bedding The Highlander. I've added The Millionaire's Royal Rescue, Wolf Raider and Coltrane Corners to my tbr and wish lists. Great hunt as always. This go round I discovered 2 new authors, Terri Osburn and Shirley Penick. I have put their books on my TBR list. The 3rd book is by Elle Boon--(a fav author), Bodhi"s Sinful Mate. Looks like a good book and series. A few of the books I want to read are Darkest Before Dawn, The Air Dragon's Secret and Her Best Man. Book on my wish list are Flowers on the Wall, The Haunting of Hotel LaBelle, and The Blood Waltz. These are now on my wishlist: The Cursed Countess, The Haunting of Hotel LaBelle, and We Are Always Watching. So many awesome books to choose from, though! LaBelle-Sharon Buchbinder and many more to my TBR list. Maybe I can blame it on spring but this time around so many authors that I already read, and then so many new authors with only a few books out. What a great way to find them and get to know them. I always LOVE these hunts. Tibby Armstrong to my TBR list and Sawdust & Satin by Shirley Penick . I am looking forward to reading these books ! I purchased The Rancher's Lady by Shirley Penick on Amazon ! Thank you for the chance ! Surrender the Dark by Tibby Armstrong, Twisted Luck by Mia Downing, Coltrane Corners by Teri Riggs and Designs on Her by Shirley Penick...all sound like some good reads! The three books that are now on my wish list are: Her Best Man, A Stranger She Can Trust, and Bedding the Highlander. Thank you for these Scavenger Hunts! Jennifer Faye, Sam Cheever and Teri Riggs all have really good looking books. Most all of them look good to me though. I've already purchased Devil's Tango (excellent book! Love the feisty heroine!) and placed Twisted Luck, Bodhi's Synful Mate, A Stranger She Can Trust, Coltrane Corners, and Dangerous Code on my "To Buy" list. Books on my wish list are Designs On Her by Penick, Coltrane Corners by Riggs, and Reckless Need by Scott. With so many great books shown, I've added several to my wishlist. The Millionaire's Royal Rescue - Mirraccino Marriages by Jennifer Faye; The Haunting of Hotel LaBelle by Sharon Buchbinder; Twisted Luck by Mia Downing top my list. Others also going on list as well. Love learning of new reads. I'm looking forward to reading Her Best Man, Her Hopes and Dreams, Wolf Raider and A Stranger She Can Trust to start. Time of the Draig by Lisa Dawn Wadler, Midnight Angel by Tracey A Wood and Her Hopes and Dreams by Terri Osburn, have been added to my wish list. So many books, so little time to read. I have a lot of books on my wish list, but I'll just pick 3 of them. A Pirate's Revenge, Flowers on the Wall, and We are Always Watching. THANK YOU SO MUCH for the hunt!!! Like I have said in the Chats these are a wonderful way to find new authors AND new things to read! Hard to pick just 3: A Stranger She Can Trust, Bedding the Highlander, and last by not least A Pirate's Revenge. Happy Spring! I marked "Her Best Man," "The Millionaire's Royal Rescue," and "Punishment Summer" as books I'd be interested in reading. On Apr 29, 2017, amandastar said: Thank you! Once again there are so many great books to check out! I'm looking at The Millionaire's Royal Rescue by Jennifer Faye, A Stranger She Can Trust by Regan Black, Her Hopes and Dreams by Terri Osburn, and Coltrane Corners by Teri Riggs. I liked most of the titles. Bedding the Highlander, A Pirate's Revenge, & Cursed Countess. I'd like to read Pursuing Elena by Sam Cheever, The Blood Waltz by Fia Dimitra and To Protect His Own by Jen Talty, among others. On Apr 29, 2017, Bounce Around Book Luvr said: Wonderful Collection of Authors and Books! Added 2 more books to my wish list. Twisted Luck, Devil's Tango are my top 2. On Apr 29, 2017, AlmaSanchez said: Spring Book Hunt books I'd like to read! I would love to read all the books but the three that seemed more interesting to me where Twisted Luck, The Cursed Countess and The Haunting of Hotel LaBelle. A Pirate's Revenge and Wolf Raider. These are on my wish list now or purchased: COLTRANE CORNERS by Teri Riggs, HER HOPES AND DREAMS by Terri Osburn, THE HAUNTING OF HOTEL LaBELLE by Sharon Buchbinder, and BEDDING THE HIGHLANDER by Sabrina York. Great reading about the Authors & their books. Bedding the Highlander by Sabrina York. On Apr 25, 2017, jaynep said: So many!!! I look forward to reading Bedding the Highlander by Sabrina York, A Pirate's Revenge by Meg Hennessy, and The Cursed Countess by Christie Kelley. Now this was an awesome hunt! Historical, PNR, Science Fiction, Thrillers, and Mysteries. Just awesome, I already had some, bought some, and added many to my tbr but here are three of them. I'm totally getting the whole Storm Series by Meredith Bond, Ava Vixien's The League of Guardians, and Clair J Monroe's Devil's Tango. Also just a heads up but as of right now you can get E.B. Black's Bright's Passion FREE on kindle. love the contest and love being able to see so many authors in one spot! On Apr 24, 2017, Renald said: Help! Tibby Armstrong #1- I put the wrong word.Sorry. Bedding the Highlander, Wolf Raider, and A Stranger she can Trust. Bedding the Highlander by Sabrina York, Bodhi's Synful Mate by Elle Boon, and Pursuing Elena by Sam Cheever. Thanks for the giveaway & Happy Spring! On Apr 22, 2017, Sylvie said: So many new books to read! Thanks so much for hosting this scavenger hunt! As always, I've found a bunch of new books I must read! I'm especially interested in Taste the Dark and Surrender the Dark, by Tibby Armstrong, Sabine Priestly's Alien series, and Elle Boon's series. Thanks again! Thanks for introducing me to some new authors. Bedding the Highlander, A Pirate's Revenge, and A Stranger She Can Trust are three books I've added to my TBR list. On Apr 20, 2017, SuzReadsBooks said: Books! Thanks for this amazing giveaway - I would love to win! I love learning about the authors and books! Three books I want to read are: The Blood Waltz, Time of the Draig - Draig, #2, and Dangerous Code. On Apr 20, 2017, stellamarealden said: Thank you! Thanks to those who added Dangerous Code! These are all on my Wish List. I cannot purchase books right at the moment. I would like to get: We Are Always Watching, The Air Dragon's Secret-The Dragon Keeper's Tale Book 1, & Midnight Angel-The Council Book1. There are quite a few more that I would also like to read!! I would like to read them all, however, the first three could be To Protect His Own, Darkest Before Dawn, and Wolf Raider. Guess I better make room on my kindle! So many good books, the three I choose are A Stranger She Can Trust, Her Hopes & Dreams and Designs on Her. Happy Reading! and Reckless Need - Heart's Temptation. Devil's Tango, Bedding the Highlander, and Wolf Raider top my list of books of interest from this contest. I loved Bedding the Highlander...and all of Sabrina York's other books! On Apr 18, 2017, TrinaC said: Love these contests! I love participating in these contests & checking out all the new reads! On Apr 18, 2017, wyndwhisper said: SO MANY GREAT BOOKS! I would love to have a bunch of them but my kindle is running out of room! LOL! The Cursed Countess, The Haunting of Hotel LaBelle & Willow's Discovery - The Willow Sisters #3 are the 3 standouts for me. However, I'll have to read the first 2 Willow Sister books before this one...always read in order! Thanks for all the great choices!!! On Apr 18, 2017, MdotDrizzi said: So Many Fantastic Books! I added a bunch of new books to my wishlist. Some of the ones I added include: A Stranger She Can Trust, Punishment Summer, We Are Always Watching and Pursuing Elena. On Apr 17, 2017, greenshamrock said: BOOKS!!! Love all the Scavenger Hunts! Great Fun Discovering new books and authors! There are a lot of good books. Some of the books I added to my wishlist are Her Hopes and Dreams, Bodhi's Synful Mate, Devil's Tango, Flowers on the Wall and To Protect His Own. So many great new books I want to read! I've added several to my wishlist. Twisted Luck, Midnight Angel, Pursuing Elena, and Dangerous Code are all waiting to be read as soon as I get better through my books in kindle! I have already bought all of Elle Boon's Mystic wolves and Iron Wolves. I added The Millionaire Royal Rescue and A Stranger She Can Trust to my wish list. I added the following and more: Bedding the Highlander by Sabrina York, The Haunting of Hotel LaBelle by Sharon Buchbinder, Twisted luck by Mia Downing. I have added 5 books to my wish list. I pull 1 book a month to purchase. they are: Her Best Man,The Millionaire Royal Rescue,A Stranger She Can Trust,Her Hopes and Dreams, and A Pirate Revenge.Thank you. I have found two new authors to me. I have added Jennifer Faye's The Prince's Christmas Vow. The Greek's Ready-Made Wife and A Princess by Christmas to my wish list. The other author is Joanne Jaytanie. I have added her The Winters Sisters series to my wish list. I purchased Lyric's Accidental Mate (Iron Wolves MC 1 ~ Bite of the Moon) and added to my wishlist . I have added quite a bunch of these to my wish list so I am not going to list them all. TBR list: The Cursed Countess by Christie Kelley; A Pirate's Revenge by Meg Hennessy; Coltrane Corners by Teri Rigg. to name a few. Thanks! On Apr 14, 2017, ElsaRey said: Love Spring, Love Books & Love Scavenger Hunts! ???? Thank you so much for the great opportunity to find more good fuel for my imagination, loved the books I want to read them! I found a lot of books I want from this list but these are the top 3. Her Best Man, Wolf Raider, and Her Hopes and Dreams. On Apr 14, 2017, pixiestyx said: Lots of great books! I added Twisted Luck, Darkest Before Dawn, Midnight Angel, Bright's Passion, Time of the Draig, and We Are Always Watching. Too many to list but would be happy to read any. surrender the dark, bodhi's synful mate, and alien attachments are now on my wishlist! There are too many to choose. I would be Happy with one. I believe Clementine's Shadow would be interesting. Fun time. Found few books to add to my tbr list. The names are calling to me. On Apr 14, 2017, lauralynn said: Good Books! Willow's Discovery, Darkest Before Dawn, and The Air Dragon's Secret all sound like good books to curl up with. I have added darkest before dawn, wolf raider and twisted luck have been added to my wish list. I have added The Cursed Countess, Taste the Dark and Midnight Angel to my wishlist. Thank you for this amazing giveaway. Both of Tibby Armstrong's books, Surrender the Dark and Taste the Dark, are now top of my wish list! I've also added Bodhi's Synful Mate (and the other books in the series) and Alien Attachments. I found a lot of books that I'm interested in. I added a ton to my list. Added to my wishlist are Surrender the Dark by Tibby Armstrong, Magic in the Storm by Meredith Bond, Bedding the Highlander by Sabrina York. I added several books to my list. I have added Alien Attachments, Coltrane Corners, and Dangerous Code to my wishlist! On Apr 13, 2017, CandyLyn said: Ooooooo!!! and on the fence about Coltrane Corners and Alien Attachments. On Apr 13, 2017, cutelittleears said: Be vewy, vewy quiet. I'm hunting Scavengers. Thank you so much for so many amazing books and for the chance to win an Amazon gift card. What interesting titles,,,,,,my three favorite are Twisted Luck, The Haunting of Hotel La Belle, and The Blood Waltz. I can see these are going to be some real page turners. I can;t wait. It's really hard to choose just three books, since I liked quite a few of them but if I had to list the ones I want to read first it would be these: Surrender the Dark, Midnight Angel and Alien Attachments. I'm looking forward to reading Flowers on the Wall by Mary J Williams, The Haunting of Hotel LaBelle by Sharon Buchbinder, Her Hopes and Dreams by Terri Osburn and Prince of Power by Nancy Gideon. I love these scavenger hunts! Always find new books and authors. 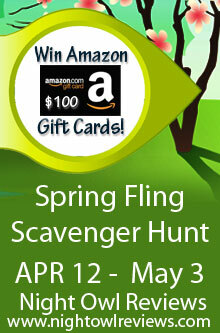 Can't wait to check out Teri Riggs and many others from this scavenger hunt. Thanks for putting another great hunt together. On Apr 12, 2017, petuniag said: Books I'd like to read. Terri Osburn - Her Hopes and Dreams, Jana Richards - Her Best Man, and Shirley Penick - Designs on Her. I love all of Jennifer Faye's books. Thank you Tami and all the amazing authors! So many new books and Authors. I love this event. I found more books then my budget allows but I'll check them off from my list as I buy them.